In a recent post, I reminisced about my very lovely flatmate, Alessandro, who shared his little flat in the Calle del Volto (off Fondamente delle Procuratie) with me. He loved to have friends over for meals and kept much later hours than I: he’d start preparing dinner around 10pm, when salami, cheese and bread would be thumped on the table. Then he’d whip a pastasciutta with a spicy tomato sauce made with flakes of pepperoncino. That done and eaten, I’d be slumped and snoozy at the table, and then, and only then, would he start preparing tiramisù for dessert, which of course, would need to sit and get perky in the 'fridge for a couple of hours. Around 1am, I'd be fast asleep when the tiramisù was finally declared to be ready, and Alessandro would be cheerfully knocking on my door brandishing dessert and announcing that he needed to come through with a bowlful wrapped in a plastic supermarket bag to be secured to the laundry pulley outside my bedroom window and conveyed to our waiting neighbor in the apartment across the alleyway. I’ve never tasted tiramisù as good as Alessandro’s. His version is strong in coffee, strong in marsala and never overly sweet. To me, tiramisù still only seems right when it’s served up in a plain kitchen dish and scooped out with little fuss and ceremony. 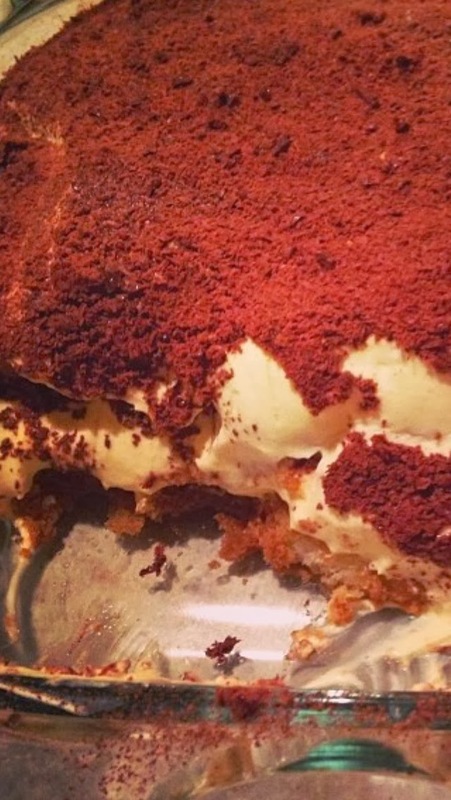 It’s well known that tiramisù is a 20th century invention from Treviso in the Veneto. Its origins are disputed, but the story that I’ve heard most often is that the recipe for tiramisù originated in the Camperol family’s restaurant Alle Beccherie in Treviso in the 1960s. The recipe was first published in an Italian magazine in the early 1980s and since then it has gradually become as familiar to non-Italians as spaghetti bolognese, pizza and gelato. Apparently, the dessert was originally called ‘tiramesù’ (‘pulls me up’) in the Venetian dialect – with its hearty combination of eggs, cheese and sugar it was thought to be particularly suitable for the elderly or invalids - although nowadays it’s more familiarly known as the Italian ‘tiramisu’ (‘pick me up’ – so called because the mixture of sugar and coffee gives the diner a little ‘lift’). Place in fridge for at least 2 hours, then when ready, dust with cocoa powder, pound on your flatmate’s bedroom door, attach the extra helping to the laundry line and serve. The photo of the tiramisu had me literally drooling, and my tummy was already full. I chuckled again with the image of Alessandro and his tiramisu travelling through your room, and then the dessert being winched to a lucky neighbour. I'll bet you miss Venice like crazy! Hello Yvonne! Trust you are a little bit drier now...and yes, I do miss Venice like crazy!